Genomic relationships and diversity of 37 wild and cultivated wheat (Triticum sp.) possessing A genome include four T. urartu (Au), thirteen wild einkorn (Am), four cultivated einkorn (Am), seven durum wheat (BBAuAu), three T. zhukovskyi (AtAtAmAmGG) and six common wheat (BBAuAuDD) were evaluated by simple sequence repeats (SSR) analysis. Genetic distance was calculated by Nei and Li using UPGMA for construct phylogenetic tree. 24 out of 35 primer pairs amplified and 22 pairs produced polymorphic amplicons (109 alleles). The highest amplified fragments (11 alleles) and polymorphism information content (0.90) was for Xgwm165-4A locus. The highest and the lowest genetic distance within groups for T. urartu and T. zhukovskyi were 0.86 and 0.55, respectively. The most similarity was between T. urartu and wild einkorn species (0.009). The highest dissimilarity observed between cultivated einkorn and common wheat,although T. urartu was more close to durum and common wheat than other diploid species. Anderson, J.A., Churchill, G.A., Autrique, J.E., Tanksley, S.D. and Sorrells, M.E. 1993. Optimizing parental selection for genetic linkage maps. Genome 36: 181-186. Brandoloni, A., Vaccino, P., Boggini, G., Ozkan, H., Kilian, B. and Salamini, F. 2006. Quantification of genetic relationships among A genomes of wheats. Genome 49: 297-305. Brown, A.D.H. 1978. Isozymes, plant population genetic structure and genetic conservation. Theor. Appl. Genet. 52: 145–157. Cox, T.S., Lookhart, G.L., Walker, D., Harrell, E.L.G., Albers, L.D. and Rodgers, M.D. 1985. Genetic relationships among hard red winter wheat cultivars as evaluated by pedigree analysis and gliadin polyacrylamide-gel electrophoretic patterns. Crop Sci. 25: 1058-1063. Dograr, N., Akin-Yalin, S. and Akkaya, M.S. 2000. Discriminating durum wheat cultivars using highly polymorphic simple sequence repeat DNA markers. Plant Breed. 119: 360-362. Dvorak, J. 1988. Cytogenetical and molecular inferences about the evolution of wheat. In: Proc. 7th International Wheat Genetics Symposium, Miller, T.E. and Koebner, R.M.D. (eds). Institute of Plant Science Research, Cambridge, UK, pp. 187-192. Eujayl, I., Sorrels, M.E., Baum, M., Wolters, P. and Powell, W. 2002. Isolation of EST-derived microsatellite markers for genotyping the A and B genomes of wheat. Theor. Appl. Genet. 104: 399-407. Gale, M.D. and Sharp, P.J. 1988. Genetic markers in wheat - developments and prospects. Proc. 7th. Int. Wheat Genet. Symp, Cambridge, U.K. pp. 469-475. Huang, L., Millet, E., Rong, J.K., Wendel, J.F., Anikster, Y. and Feldman, M. 1999. Restriction fragments length polymorphism in wild and cultivated tetraploid wheat. Plant Sci. 47: 213-224. Incirli, A. and Akkaya, M.S. 2001. Assessment of genetic relationships in durum wheat cultivars using AFLP markers. Genet. Resour. Crop Evol. 48: 233-238. Kimber, G. and Feldman, M. 1987. Wild Wheat: An Introduction”. Special Report No. 353, University of Missouri, Columbia. Lilienfeld, F.A. and Kihara, H. 1934. Genome analyze in Triticum and Aegilops. V. Triticum timopheeviiZhuk. Cytologia. 6: 87-122. Miller, P.J., Parfitt, D.E. and Weinbaum, S.A. 1989. Out crossing in peach. Hort. Sci. 24:359-360. Mollaheydari Bafghi, R., Baghizadeh, A., Mohammadi-Nejad, G., and Nakhoda, B. (2014). Assessment of genetic diversity in Iranian wheat (Triticum aestivum L.) cultivars and lines using microsatellite markers. 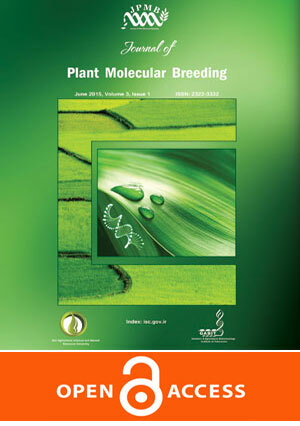 Journal of Plant Molecular Breeding, 2(1), 74-89. Murray, M. and Thompson, W.F. 1980. Rapid isolation of high molecular- weight plant DNA. Nucleic Acids Res. 8: 4321-4325. Nei, M. and Li, W.H. 1979. Mathematical model for studying genetic variation in terms of restriction endonucleases. Proc. Natl. Acad. Sci. USA. 76: 5269-5273. Plaschke, J., Ganal, M.W. and Roder, M.S. 1995. detection of genetic diversity in closely related bread wheat using microsatellite markers. Theor. Appl. Genet. 91: 1001-1007. Pujar, S., Tamhankar, S.A., Rao, V.S. and Gupta, V.S. 1999. Arbitrarily primed-PCR based diversity assessment reflects hierarchical groupings of Indian tetraploid wheat genotypes. Theor. Appl. Genet. 99: 868-876. Roder, M.S., Korzun, V., Wendehake, K., Plaschke, J., Tixier, M.H., Leroy, P. and Ganal, M.W. 1998. A microsatellite map of wheat. Genetics. 149: 2007-2023. Sax, K. 1918. The behavior of the chromosomes on fertilization. Genetics, 3: 309-327. Soleimani, V.D., Baum, B.R. and Johnson, D.A. 2002. AFLP and pedigree-based genetic diversity estimates in modern cultivars of durum wheat [Triticum turgidum L. sub sp. durum (Desf.) Husn.]. Theor. Appl. Genet. 104: 350-357. Tanksley, S.D., Young, N.D., Paterson, A.H. and Bpnierable, M.W. 1989. RFLP mapping in plant breeding: new tools for old science. Biotechnol. 7: 257. Vavilov, N.I. 1926. Studies on the origin of cultivated plants. Institute of Applied Botany Genetics and Plant Breeding. Leningrad. Wang, H., Wang, X., Chen, P. and Liu, D. 2007. Assessment of genetic diversity of Yunnan, Tibetan and Xinjiang wheat using SSR markers. J. Genet. Genom. 34: 623-633. Zohary, D. and Hopf, M. 2000. Domestication of plants in the old world: the origin and spread of cultivated plants in West Asia, Europe and the Nile Valley. 3rd ed. Oxford University Press. Oxford, UK.